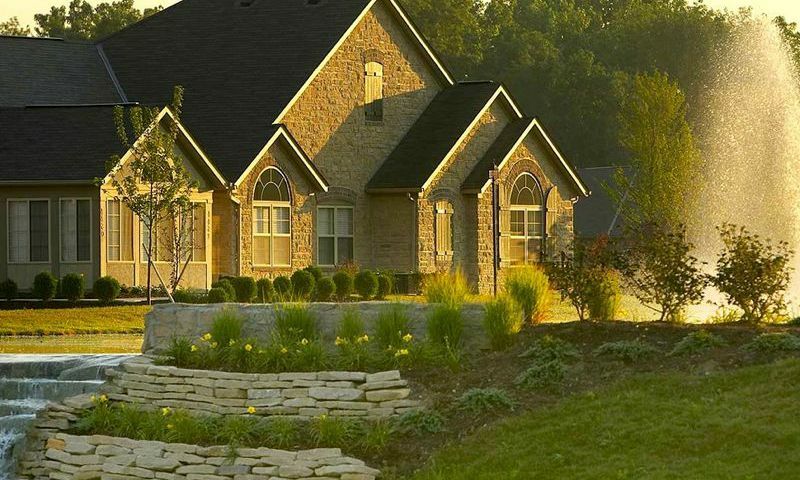 Villas at Roxton Ravine is an active lifestyle community located in Lancaster, Ohio. Homeowners can live in a quiet neighborhood setting with only 100 attached homes built on the site of a 19th century garden estate. Residents also enjoy a maintenance-free lifestyle that allows them to have more time to pursue other hobbies and interests. A charming clubhouse provides homeowners with a great social space to gather with neighbors and make lifelong friendships. Residents gather at the clubhouse for social and recreational activities in Villas at Roxton Ravine. The clubhouse is a restored colonial building that adds character and charm to this inviting community. It has an exercise room where residents can stay in shape without traveling too far. They can also host parties or events in the multi-purpose room. The clubhouse features great outdoor amenities as well. Residents can take a dip in the swimming pool or relax with a good book on the spacious patio. The clubhouse is a great place to join neighbors, family and friends any day of the week. Construction of Villas at Roxton Ravine began in 2005 by Epcon Communities. The community will consist of 100 attached homes upon completion. Homebuyers can choose from four distinct floor plans: Abbey, Canterbury, Villa, and Chateau. Attached homes in Villas at Roxton Ravine offer 1,269 to 1,943 square feet of living space. They have two or three bedrooms, two or two-and-a-half bathrooms, and an attached two-car garage. These homes feature spacious layouts, private garden patios or four-season verandas, gourmet kitchens, walk-in closets, and luxurious fixtures. Residents of Villas at Roxton Ravine enjoy a low-maintenance lifestyle thanks to a homeowners’ association (HOA). The HOA fee covers landscape maintenance, snow removal, common area lighting, exterior building maintenance, street and driveway maintenance and repair, and clubhouse upkeep. Homeowners have more time to pursue their own interests instead of worrying about the hassles of yard work and exterior home care. They can start a club, work on a new arts and crafts project, or just relax with a good book in the comfort of their own home. Ideally situated in Lancaster, Ohio, residents of Villas at Roxton Ravine enjoy easy access to many attractions and everyday conveniences. They can shop at River Valley Mall or Plaza Shopping Center, both of which are located a few minutes away. Grocery stores like Meijer and Kroger are easily accessible via Routes 33 and 22. Fairfield Medical Center and Riverview Surgery Center are five miles away. The Villas at Roxton Ravine is a serene active lifestyle community with affordable homes in a convenient location in Fairfield County, Ohio. Check back soon for more information on the lifestyle in Villas at Roxton Ravine. 55places.com is not affiliated with the developer(s) or homeowners association of Villas at Roxton Ravine. The information you submit is distributed to a 55places.com Partner Agent, who is a licensed real estate agent. The information regarding Villas at Roxton Ravine has not been verified or approved by the developer or homeowners association. Please verify all information prior to purchasing. 55places.com is not responsible for any errors regarding the information displayed on this website.